Google's latest version of Android will remind you to pick up your dry cleaning, it will turn on your dishwasher, and it will replace your credit card. 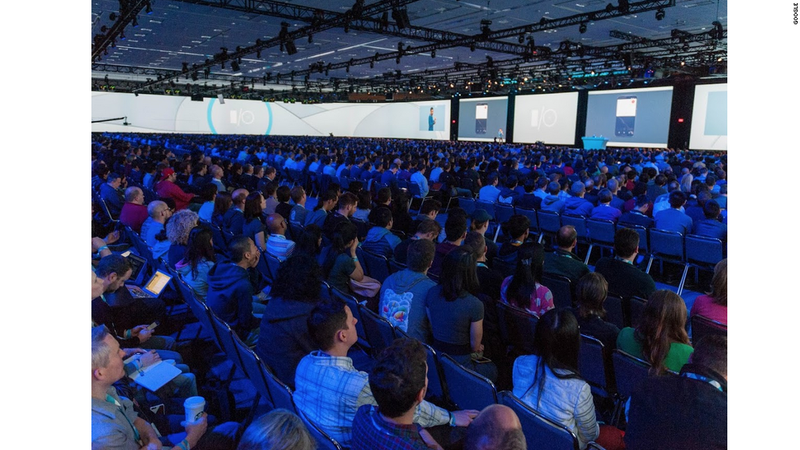 The company announced the new operating system, codenamed "Android M," on Thursday at its annual Google I/O developers conference in San Francisco. It also announced a new app called Google Photos, which will give you unlimited online photo and video storage. Android M focuses on subtle improvements to the user experience, including squashing a ton of bugs and overhauling basic features, according to Dave Burke, Google's VP of engineering. The biggest news is Android Pay, Google's (GOOGL) latest take on mobile payments. It's pretty similar to Apple (AAPL) Pay, and a big improvement over Google Wallet, the companies earlier attempt at a mobile wallet. Just unlock your phone and tap on a reader -- no need to open an app. Google has been working with major credit cards and U.S. mobile carriers on Android Pay. The open platform works with any other device with NFC and users can pay for goods at more than 700,000 stores across the United States. Third-party apps can also use Android Pay inside their apps, so you can pay for your Lyft with Android Pay. Other Android M improvements include a new permissions tool that give users more control over what data they share with apps. Prompts and a reorganized setting screen let them manage what apps can access things like location, camera, microphone, contacts and sensors. Chrome Custom tabs will offer in-app browsing, sharing things like login information between apps and the browser. When you click on links in apps, they can now open directly inside apps instead of asking users to choose between a browser and an app. In an attempt to get more battery life, Andoroid M will have a feature called Device Sync Activity. It tracks your activity to tell when you're not using your phone much and put the phone into a "doze" mode that uses less power. Future phones will support multi-tasking USB Type C cords for charging and data transfer. And Following in the footsteps of Apple, Google will now offer HBO Now on Google Play for Android and Chromecast users. Google announced a new tool called Google Photos that lets you store all of your photos and videos in one place, for free. Available Thursday, it accepts an unlimited number of images up to 16 megapixels or videos up to 1080p. It's a way to gather all images in one place instead of spread out across devices, Dropbox and desktops. It organizes photos by who's in them (using facial recognition), where they were taken and what's in them. That means if you have a kid, you can zoom through their life in photos. Or after a breakup you can relive the entire painful thing in chronological order while eating ice cream and sobbing. The app can also make collages and edit movies. It seems similar to Apple Photos, but Google has actually always had really impressive photo features. Recently they've been locked away inside Google Plus or forgotten about in the Picasa desktop application. Now they are free. Google Now is Google's three-year-old predictive assistant tool that gives you information it thinks you'll want, before you ask for it. A new feature called Now on Tap lets you access Google Now powers in the moment, wherever you are on the phone. Google on Tap is following along and picking up on context, in any app you're using on your smartphone. Talking about a movie with your mom over email? Hold down the Home button and Now on Tap will pop up reviews and times. When you're in a music app listening to a song, you can use voice commands to ask a question about the band ("What is his real name?"). Text messages can be turned into calendar events, and improved natural-language processing does cool things like figure out mispronounced words based on context. Google also announced Brillo, an operating system for the Internet of Things. That's the much ballyhooed word of regular "dumb" objects and devices that are hopping online. Based on Android, Brillo will be available to developers later this year. Brillio includes a language called Weave for all those objects to speak to each other, mobile devices and the cloud. Right now IoT devices use a number of different communications protocols, which is problematic. Adding yet another language could unify them ... or just add more fragmentation. Google predicts the next billion people to get online for the first time will do it with a phone in 2016. That's a lot of potential customers, but one problem they'll face is slow internet connectivity. Google is optimizing its apps so that they work better over shoddy connections. Chrome has been optimized to load pages faster, stripping out unnecessary bulk from webpages. Google is also focusing on making more content available offline, like Chrome pages, YouTube Videos and Google Maps. Offline Google Maps will be available for everyone, and include turn-by-turn directions, search and information about different places, all without an Internet connection. Because if you are really, truly lost, you very likely don't have one.